How we increased Client's Earnings by 400% over 18 months! 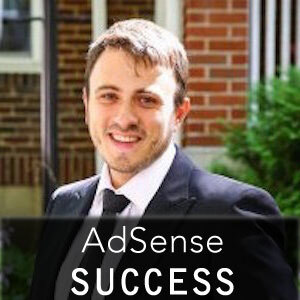 Being a successful AdSense publisher is tricky and requires a good deal of hard-work and luck. Between creating good content and trying to get search engine rankings (to increase web traffic and ad earning), you can get overwhelmed, overworked and sometimes discouraged, if you do not see the (desired) results quickly. However, as we have discovered through years of testing, and getting different penalties left and right (will talk about this one later), you can still maintain good ad income and sometimes even increase it through optimising ad performance (always within AdSense guidelines of course) even with stagnating or falling traffic! As you can see in our client’s 18-months (from Jan 1, 2013 to July 10, 2014) AdSense earnings graph below, with relatively stable traffic (except for last couple of months) the web traffic remained mostly stable and even dropped some, between Aug ’13 and Apr ’14. At the same time the RPM grew about four-fold. You guessed it correct if you said that (monthly) ad revenue also grew about 400% in the same time period over 18 months span. UPDATE: See how I increase Income by 70-130% on my own investment sites purchased from Flippa marketplace. By just doing a simple math you can see that if you maintain the same traffic level while increasing your RPM (Revenue / 1000 ad impressions), you income will increase with the RPM growth. If at the same time you are adding web traffic to our site, the income will grow exponentially. While this made our client VERY HAPPY (to say the least), how we achieved this is a bit less glamorous. Our basic premise was that you need to use your existing resources to its full(est) potential. The results of this are just above in the Traffic / RPM graph. Number one thing than many publishers need to understand is that you CANNOT control either web (organic search) traffic or the Cost per Click (CPC) or the RPM. We use RPM as our metric of choice, to gauge the success, as it represents your actual income based on traffic. We do not use CPC, as you can have clicks that pay $1 or more, but if you get very few of those, the RPM will still be low. At the same time publishers CAN influence both TRAFFIC and RPM, by creating great content, making various social and search marketing “improvements” to grow traffic, and optimize Ads to increase CTR (click-through rate) to drive more revenue from their websites. However, most information available on the internet will not help you with the latter, as truly successful publishers will never tell you their secrets. Thus you are left reading information from (mostly) wannabe’s on how to optimize your ad placement. To see for yourself, go to Digital Point AdSense forum section and read answers to some questions on ad placement. From what we’ve seen, most of these experts have no clue. The answer is – of course. That is how we did it. But it takes VERY long time. Took us about 5 years to figure it out, and we are still not done learning. 0) ALWAYS stay with AdSense guidelines, unless you want to risk losing your account! Breaking the rules gets people “punished” and Google is very good (bad) about it. Just read some of the “I lost my AdSense Account” threads on Digital Point Forums. 1) You need some traffic to your site. The more the better, but even with 200-300 unique visitors / day, you will have enough data to for proper A/B testing. 2) A/B Test ad units or placement: Take your most visited pages (top 3 – 5) and create A/B tests with two different ad units or placements at one time. Do not test more than two variables simultaneously, as it will throw you off when analyzing results. Test these for at least 1 week EACH, to get better data.Better yet, give it two weeks – start on Monday, and on Sunday of the following week. Start all experiments at Midnight. If most of your traffic is from another location, see which location brings most visitors, and use that as your midnight starting point. 3) A/B Test your website design: Once you figure out best ad size, style and placement, do split testing with different site designs. For example, left sidebar VS. right sidebar. Test using sidebar units (160×600 skyscraper vs. 300×250 rectangle units), etc. 4) Split test IMAGE ads vs. TEXT ads. This is optional, and before you do it, take your AdSense data for at least last 3 months and see which ads perform better. Our research shows that while TEXT ads do much better than IMAGE ads, disabling images all together WILL decrease your total RPM, because of how AdWords bidding process works. It is counter-intuitive to us, but that is what our results show, over two weeks testing period. While there is no magic bullet, once you begin to understand the basic optimization techniques that work for YOUR website / content / niche, you will be able to improve your profit by just tweaking the few things around. Once that is done, you can go back to creating great information for your visitors. If you don’t have time or resources to do this or want to speed up the process, you can contact us – we can help you improve your AdSense performance to create your own AdSense Success! but you don’t say anything about your services and have no contact information. Are you trying to get clients or not? I’m trying to get clients – but not very actively (there is a reason). My main goal is high profile clients, while most people reading this site are not ready to hire me due to high(er) cost. Why does my rpm changes from $4.7 to $0.30 in one day? I really hate this, please is it my content or? I don’t know – there could be many reasons. Could be that one of the high paying advertisers stopped showing on your site. Could be something else. Is it just one day RPM … or it’s been going on for a while? Did your CPC drop? I recently got adsense approval. How can you people help me out to boost my revenue? 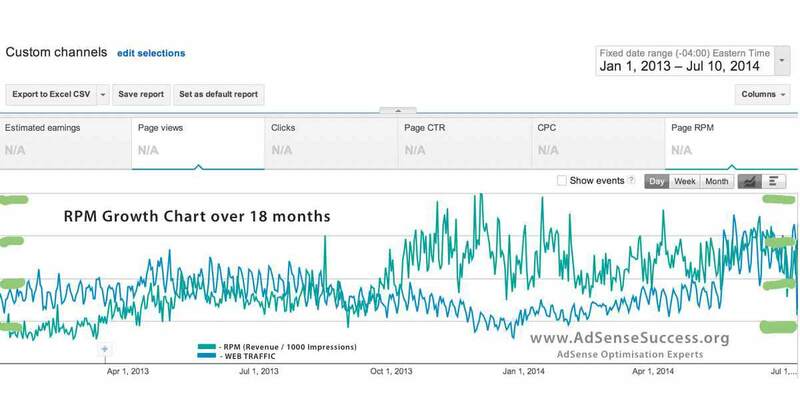 3) Implement best performing ads. 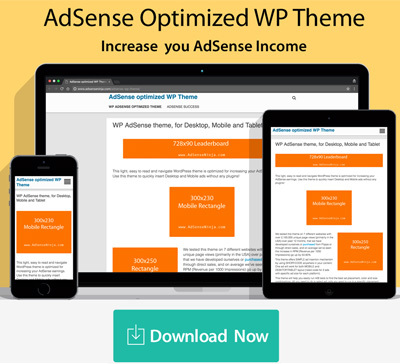 We don’t do site optimization – instead, we have an upcoming Udemy course that will teach you ALL that we know, and an AdSense Optimized WP theme which you can install on your blog. Great article for RMP. We try your techniques to improve the revenue of website. How can i choose the high RMP advertiser in Google ads. You can’t “choose” RPM 🙂 … RPM is a product of how many people come to site, how many ads they click and how much each click pays. To increase RPM, it’s best to provide great content with smart, non-intrusive ad placement. Does Keywords increase the CPC? and Why does my rpm changes from $4.7 to $0.30 in one day? I really hate this, please is it my content or? Keywords do affect the CPC, but there are many different factors that go into it. Best to concentrate on quality content for humans – it works for me every time. As for your actual website – I’d get rid of black background. Also, you have “thin content” … one image and 3 sentences don’t give much info to google to serve good ads… more text usually means better ads. Great tips. I am still struggling with my Adsense earning (very low), you give me a lot of food for thought, I’m glad I stumbled upon this site. I have to work on my PR and make sure my blog is SEO friendly, then. Thank you for sharing! But Can Template reduce RPM? So template/theme can have a huge effect on RPM. $0.45 does seem kinda low, but it depends on traffic too. If you have 100,000 daily uniques, overall income will be pretty good. Now on your site – I’d first get rid of 728 leaderboard in header. People never click those. Also I’d get rid of red border around posts, and make white bg all the way through left column – this way top rectangle will blend in nicely with content. Please, does ad review center increase revenue I review ads daily? I do not use ad review center, therefore I can’t really say if it helps or not. I create custom experiments, by adding unique tracking channels to each Ad unit or group of units, and comparing them to a 2nd set of units, and then run a custom report. This gives me a much better picture of what really happens, and I can then go into details about device type, etc.